Travelers from all over the world have been arriving in Sand Cove to vacation since the 1830′s. The old farm house was first built around this time and the owners would take in guests for the summer season, providing an escape on the coast away from the bustle of the big cities of New York and Boston. Traveling often by train, guests would arrive in Ellsworth where they would be met by horse and cart for what was then a long and bumpy journey to the peninsula. The above pictures shows guests arriving probably around 1890, a spectacular view of Sand Cove from the vantage point of the steps to the farmhouse remains unchanged to this day. Nowadays there are easier ways to make your trip to the serenity of Schoodic. Many of our guests choose to drive; a great way to come to the best part of Down East Maine. Our inn is about 20 minutes north of Ellsworth, 5 minutes from Acadia National Park at Schoodic. Pictured here are one of our favorites from a previous year, the Austin Healey Owners Club, that rallied in convoy coming from all over New England to enjoy the spectacular October fall foliage. Arriving by air can of course cut down on your travel time. Our nearest airport is Bar Harbor (30 mins approx.) planes from Colgan Air (1 800 272 5488)fly in there directly from Boston. Bangor International Airport (1hr. from our inn) is one of our guests favored touch down points, serviced by Delta (1 800 221 1212), US Air (1 800 428 4322), Continental (1 800 525 0280) and United Airlines (1 800 241 6522). With direct flights from both national and international locations this is a very convenient airport to use. Additionally very competitive car rental rates can be obtained at Bangor International, with many of the national companies represented, including Avis (1-800-331-1212), Budget (1 800 527 0700) and Hertz (1 800 654 3131). Portland Airport is the next nearest large airport (3 hrs south). If you hope to arrive by private sea plane there is a lot of ocean to land on all around us but you will need to check with the local air traffic control for authority and clearance. If you have wheels you may be able to land at Bar Harbor Airport (207 667 2611). Our Sand Cove is relatively sheltered with a couple of yachts moored here during the summer season. The bottom is very fine white sand, so two anchors are strongly recommended with Bruce and Plow anchors favored by many of the visitors to the bay. Also if you would feel happier to leave your yacht on a mooring, Winter Harbor Marina Trading Corp. (207 963 7449) provides a very sheltered spot about 5 minutes from the inn, reservations are recommended. Down East Maine is one of the worlds finest sailing grounds, with thousands of islands to explore and wonderful wildlife to discover. You don’t have to bring your own yacht with you to enjoy all the ocean has to offer. While staying at Oceanside Meadows you can take advantage of heading out on the water on a real Maine lobster boat charter, or try sea kayaking and canoeing with a local outfitter and guide service. General directions from points south: I-495 N to Bangor, exit 182A to Rt 395, exit 6A to Rt. 1A, drive in to Ellsworth, turn left on Rt. 1 (north). Drive 19 miles, turn right onto Rt. 195; at T-junction turn left, take first right (Rt. 195 to Corea); continue on Rt. 195, bearing left, soon you will see the ocean on right and the inn on your left. We have detailed directions from Bangor International Airport and Bar Harbor/Trenton Airport. Exit the airport by taking Godfrey Blvd. past the car rental stations, parking, and passenger terminals to the stoplight at Union St. Take a right onto Union St. and continue east for about a mile until you see signs for Interstate 95. Turn right onto Interstate 95 south to exit 45A, only a couple miles south. Exit 45A merges with Interstate 395. Take 395 until it ends at exit 6A. Taking exit 6A, you will merge onto US Rte. 1A North. Follow Route 1A North to Ellsworth. After you have passed through most of Ellsworth, you will notice signs directing you towards Bar Harbor if you continue on Rte 3. south, or towards Downeast/Coastal Region by following US Rte. 1. Continue on Rte. 1 North by turning left in Ellsworth. Drive along Rte. 1 North approximately 19 miles, enjoying your first glimpses of the coast. Pass by the welcome sign to the Schoodic Peninsula and turn right onto Rte. 195, the Pond Rd. Head down the Pond Rd. about 5 miles until you reach the “T” Junction. Turn left for a couple hundred feet, then right again to continue on 195 towards the village of Corea. Head a mile down Rte. 195, the Corea Rd., bearing left. You will see the two inn buildings on the left and the crashing surf on the right. Turn up the driveway past the flagpole and park behind the Captain’s House. 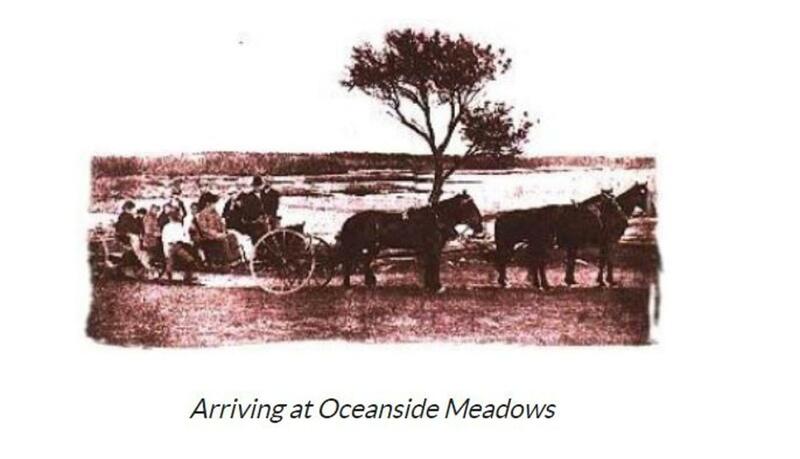 Welcome to Acadia’s Oceanside Meadows Inn! Exit the airport by turning north onto Rte. 3 North. Just after the Acadia Zoo, turn right on Rte. 205. At the T-Junction, turn left then immediately right, and carry on until you see, on your left, the “Mud Creek Rd.” and the sign to Rte. 1. Turn left on Mud Creek Rd., follow to “T” junction with Rte. 1. Turn right onto Rte. 1. Drive along Rte. 1 North approximately 15 miles, enjoying your first glimpses of the coast. Pass by the welcome sign to the Schoodic Peninsula and turn right onto Rte. 195, the Pond Rd. Head down the Pond Rd. about 5 miles until you reach the “T” Junction. Turn left for a couple hundred feet, then right again to continue on 195 towards the village of Corea.